What Is DA Form 5988-E? DA Form 5988-E, Equipment Maintenance and Inspection Worksheet (EGA) is a form used to record faults found during the inspection of Army-owned equipment after missions. These faults include PMCS, maintenance activity inspections, diagnostic checks, and spot checks. When a mission is complete, the operator performs the after-operation preventive maintenance checks and services (PMCS) on the equipment and annotates new faults on the DA Form 5988-E. The form - sometimes incorrectly referred to as the DD Form 5988 - was released by the Department of the Army (DA) in March 1991 with all previous editions being obsolete and is now filed digitally using the appropriate software. A printable DA Form 5988-E is available for reference download below. The DA Form 2404, Equipment Inspection and Maintenance Worksheet is a similar form used to record the actions taken for quality control and the battlefield damage assessment and repair (BDAR) performed. The main difference between the two forms is that the DA 5988 is automatically printed off by a clerk and primarily used for vehicles (though it can be used for any other equipment) while the DA 2404 is manual and mainly applied to the inspection of individual equipment. How To Fill Out Da Form 5988-e? 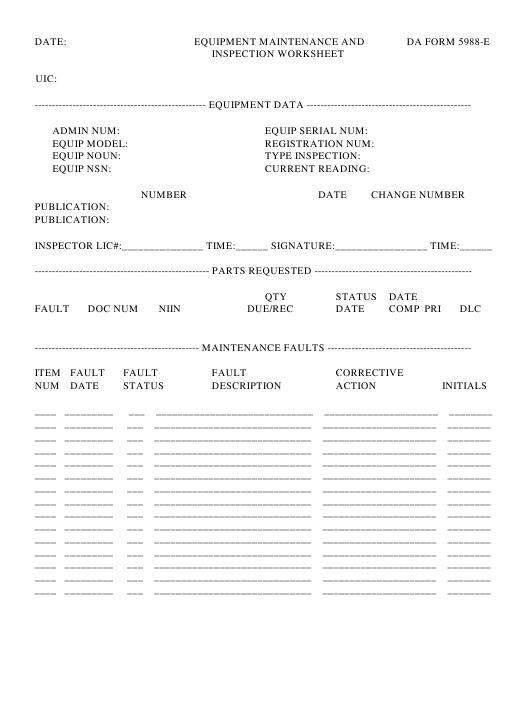 This form allows the user to print an equipment maintenance and inspection worksheet for each piece of equipment by DODAAC, administrative number, or Federal Supply Catalog (FSC) to facilitate PMCS and other scheduled inspections. The personnel responsible for keeping information in the forms correct are first-line leaders, maintenance supervisors, commanders, operators, and crews. The way certain blocks are completed may vary depending on the purpose of a particular form. Box 1 should identify the organization working on the item of equipment. Box 2 requires the abbreviation and model of the equipment. If the form is used when inspecting a watercraft, the box should contain the abbreviation and the Hull Design Number. Box 3 is for the registration or serial number. Box 4a requires the number of miles or kilometers from the odometer rounded to the nearest mile or kilometer if the deficiency or a shortcoming is found. If there are no faults or the equipment does not have an odometer, the box should be left blank. Box 4b is for an hour meter reading if the fault is found. Boxes 4c and 4d should be left blank. Box 5 is for the date the shortcoming or deficiency was found. Box 6 should contain the inspection type. Box 7 requires the number and date of the PMCS technical manual used for the inspection and maintenance. When any shortcomings are found, the person performing inspection signs Box 8 and provides their rank. Box 9a is signed by the commander or their representative. Box 9b should be left blank or used according to local needs. Box 10 is used as required locally or left blank. Column A is for the technical manual item number, applicable to the fault in Column C. Column B is for the status symbol. A list of symbols can be found under Box 7. If no faults have been found, the DA Form 5988-E should be stored in a protective cover or in the equipment record folder until it completed. If any faults are found during the preventive maintenance checks and service (PMCS), the document will be transferred to the maintenance supervisor for action. Copies of the DA 5988 used for scheduled services are placed in a file for quality control and kept until the next service is performed. If the form was used for documenting technical inspections, it should stay with the item until either maintenance is performed or the item is disposed of.